No Middle Eastern meal is complete without these traditional slightly leavened, round, soft breads. 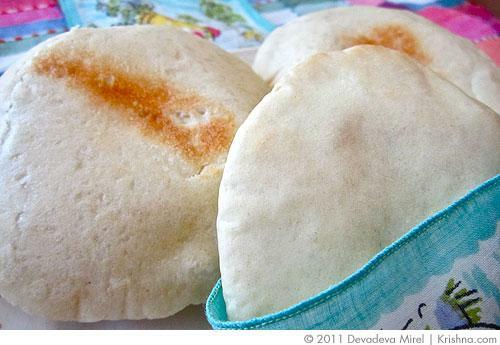 Sometimes called Khobz, or pocket breads, they are becoming increasingly popular in the west. Try baking them yourself. Distinct from traditional breads, these breads rise only once and are then baked at a very high temperature for a short time. During the process the dough separates to form the pouch or hollow, enabling the bread to be later split in half and stuffed. Traditionally, this bread is made with strong white flour, but if you wish you can substitute whole meal flour or softer white flour (you might then need to adjust baking time). Pita breads can be served with a traditional Middle Eastern meal (see section in the book on menu planning), filled with your favorite salad along with Falafel, or used as a base for Asparagus and Pine Nut Pizza. 1. Combine the yeast, warm water and sugar in a large bowl. Stir thoroughly to dissolve the yeast. 2. Stir in the flour and salt and knead for about 5 minutes to form a smooth dough, sprinkling on a little extra flour if required. 3. Shape the dough into a cylinder. Divide the dough into 24 portions for small pitas or into 12 for large pitas. Shape each portion into a smooth ball. Place the balls on a floured surface and cover them with a cloth. 4. Carefully form a ball into a smooth, crease-free disk and roll out on a floured board with a rolling pin to form 1/4 inch (0.5 cm) thick bread. Repeat until all the breads are rolled. Small breads should be about 5 inches (12.5 cm) in diameter, and large ones about 8 inches (20 cm). 5. Preheat the oven to 465 F [240 c]. Place the loaves on a floured bench top in a draught-free area, covered with clean, dry tea towels. Do not allow the breads to dry out. The breads should rise for 30-45 minutes. 6. Place 1 large or 4 small pitas on an ungreased baking sheet and bake on the bottom of the hot oven for 3-4 minutes. When cooked, the bottoms should be golden and the tops cream colored. Remove and wrap the pitas in dry tea towels. Repeat until all the breads are done. Note: Take care not to leave the oven door open between batches, and don’t allow the breads to go crisp or brittle. They should be soft and flexible when they come out of the oven. If you’re not going to use the breads straight away, allow them to cool and store them in plastic bags until required. From Kurma Dasa's "Great Vegetarian Dishes".